I opened up the wrapper, which is resealable for portion control. The bar is huge, even sharing (yes I did actually share) we ate this over several nights. The chocolate pieces are bigger too, and each one is topped with a chocolate peanut design. The filling consist of peanut, rice crispies, a soft peanut paste like filling and caramel, which oozes slightly when you break a chunk off. The flavours are a perfect mix of chocolate and nut, with a heavy dose of caramel for good measure. I love a mix of textures and this bar delivers that, with the peanuts being both crunchy and smooth. 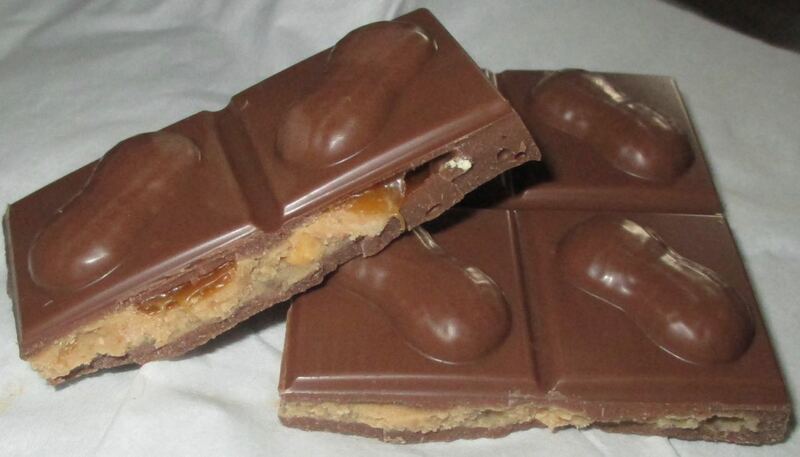 This bar works by having that mix of sweet and savoury, with the peanut adding that salty nutty goodness, and there being loads of sweet flavours from the creamy chocolate and the caramel. Each mouthful differs slightly in the ratios, but all have the distinct peanut flavour, that mixes well with the chocolate. The size of the chunks makes it a satisfying eat, filling and enjoyable. I say it with a little bias, as I love nuts, but I thought this bar was heaven. One last thought, this bar categorically contains peanuts, it is all about the nuts. The back of the pack’s ingredients label lists peanuts in various places, but also states “May Contain Nuts”; I’m not sure I understand ingredients labels anymore.